These darling covers continue to delight me. I am such a sucker for a good silhouette, and the multicolored macarons on this one really do lend it just the right whimsical air. 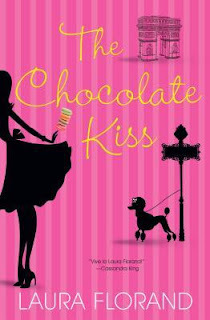 I could hardly wait for my copy of The Chocolate Kiss to arrive once I'd finished The Chocolate Thief. It was just such a delightful surprise of a read, made that much sweeter by the knowledge that there were two more books in the series already out there just waiting for me. As feelings I get to experience in my life go, that is one of the ones I savor the most. This series does not follow the same characters, but branches out into side characters. We get glimpses of the previous ones, though, and of course the irresistible Paris setting remains. I had heard somewhat mixed opinions on this second volume. Some were not that enamored of the slight elements of magical realism, others found themselves absolutely charmed. I find when it comes to magical realism, readers really can go either way. For the most part, I tend to really enjoy it. As long as the author has an even, light hand and is careful to shore the fantastical elements up with a solid sense of place and realistic motivations and histories for her characters. Magalie Chaudron has never belonged anywhere. Wrenched back and forth by her terminally transient parents, she grew up here and there, traveling back and forth from the lavender fields of Provence to the hills up upstate New York at the whim of a mother and father who both could not leave their homes and could not be long without the other. They prided themselves on their supremely adaptable, eminently self-reliant young daughter who could not only put up with the impermanence of their family but also brought joy to their lives. But when she came of age, Magalie took matters into her own hands. Moving to Paris, she made it through university and gratefully accepted the offer of her two maiden aunts to come and live above their salon de thé on the Île Saint-Louis in the middle of the Seine and work in their shop making her delicious chocolat chaud. And suddenly, in her little one-room apartment above La Maison des Sorcieres, Magalie finds home. And if she sends a few wishes for the people who drink her chocolate as she stirs and stirs the pot in her blue-tiled kitchen, well, who is she to say if they actually come true? And everything is stable. And there is no reason to believe she will be wrenched once more from this self-made home that fits her like a glove. Until Lyonnais arrives. Philippe Lyonnais, to be precise. With his world-famous pastries and his elegant shop, he invades her private island without a second thought for the struggling salon de thé down the street. Unwilling to give up her safety or her livelihood, Magalie confronts the lion in his own den, only to be rebuffed and brushed aside like the tiny speck of dust he clearly believes her to be. And so the battle begins.
" . . . if you send another spoiled blonde my way, I'm going to feed her something that makes her fall in love with you, and see how you like it." Magalie's arrogant expression flickered. Abruptly she seemed to notice the winter-evening dimness of the apartment and crossed to turn on the light by her bed. Her heels sounded wrong on the apartment floor, too aggressive for this space. He wondered if she usually took them off by the door. Had his presence required her to keep on her armor? "I don't feed them anything to make them fall in love with you." She frowned deeply, seeming unsure where to put herself. Maybe usually she sat on the edge of her bed now, kicking off her shoes, curling up to examine her purchases . . . His blood surged long and slow and hot through his body at the image. "A poor, innocent princess? Why would I do something like that to her?" "They don't look that innocent to me, but thank you for reminding me of moral considerations," he said politely. Really? She hadn't been sending those would-be seductresses his way? Something bitter was released in him, dissipating so fast, he had to struggle to keep his fighting form. "It's true, it would be quite reprehensible to make anyone fall in love with you." Her eyes flashed. He almost laughed. This was fun. He felt aroused and infuriated and so alive, he held himself still only by his years of self-discipline. He knew how to pay precise, attentive care to the smallest of movements, how to wait as long as it took for something to be perfect. She dropped her packages onto the bed, started to take off her jacket, and stopped herself. Oh, so she would usually shrug out of her jacket about now. And drop it carelessly across her bed or hang it up? No, hang it up. The room was so peacefully uncluttered. "If I wish anything on anyone, it's usually strength and courage and clear-seeing, which they never seem to have enough of. I have no idea why that would lead them to you." She looked as if she had bitten into something rotten in polite company and didn't know where to spit it out. Strength and courage and clear-seeing. He felt himself draw a long, deep breath, like at the gym when he had just finished a punishing set of exercises well. Or at the Meilleur Ouvrier de France trials when the last, extravagant, impossible spin of sugar held. "Thank you," he said, "for the compliment." The extraordinary, beautiful compliment. It was such a lovely moment, I'm honestly just as affected now, rereading it. It's hard to sum up the many reasons why I connect with these books, but I feel sure saying that in this case it was because I felt the arc of a relationship was so evenly and lovingly drawn. Because I liked them both so much. And because Magalie's journey particularly resonated. I grew up here and there, too. I know what it is like to not know how it is going to go each day in a new place. And I know how quickly the just-now familiar faces and spaces can be replaced with new ones, unfamiliar and uncertain in their newness. At the same time, folding is not an option. And as hard as she holds out, Magalie knows when something is important. It was hard to trust in happiness, coming from another person, but . . . there was so much of it, around him. There really was. I'm so glad I got to witness it. The Brazen Bookworm - "This is not a book to rush through but to linger over, preferably with a cup of hot chocolate." Chachic's Book Nook - "These books focus on hot guys who make delectable desserts. What’s not to like?" Dear Author - "This is one of the cleverest, most persuasive enemies-to-lovers stories I’ve read in a long time." Fiction Vixen - " I enjoyed every page of this delightful novel." Nooks & Crannies - "A romance that is as delightful as it is sinfully delicious." Sara in Bookland - "the author's ability to describe Paris and the Île Saint-Louis and to transmit her love for these places was the best part of the book." Smexy Books - "Adorable, charming, whimsical. These are the words that first came to mind when I finished this book." I trust you implicitly. Thanks again, girlie. I *loved* this one. I guess it's appropriate to say, "Ooo la la," since we're talking about Paris, chocolate, and hot guys. I wasn't aware of this series, but the covers are striking! I take it this is book 2? I happened to pick this up when I was at the library today (they had it displayed). I liked, but didn't looooove, the first book (the setting was fab), but the summary of this one sounds much more my thing. Did you? Well, fwiw, I do think it's worth reading even if you didn't love the first one. It's got a lovely fairy tale vibe going and left me with a very big smile on my face. Love these covers. So sad Kensington isn't continuing with them in the series. i love the covers for this series, too. AND i just got the first one. weekend reading sorted! "One of my favorite things about Laura Florand's male protagonists is the way they own their emotions. They are not ashamed of them and they are not interested in squelching them." Yep, I love that about Laura Florand's heroes as well. Yay, so glad you loved this one as well, Angie. I wasn't sure how you'd feel about it because of the magic realism feel of the whole thing but I loved it. I liked that it was different from The Chocolate Thief. And there were just so many passages that I highlighted because they stood out for me. That scene that you chose is a good one. They're so much less angsty in that particular way, and I *love* that about them. I wasn't sure how I'd feel about it either, but I just loved it. And you are so right, I wound up with so many passages highlighted. Can't thank you enough for pointing me in Florand's direction, Chachic! Awww, this book looks adorable. I really need to look into this one and the whole series. I agree, the cover for this is darling. Adorable is a good word for this book. :) I know I'll be returning to it. Hi Angie! Funny that you linked to my review because just a few days back I was on your blog going through your review of Megan Whalen Turner's The Thief series! :) I'm reading the last one right now and hope to pen down my thoughts on it soon. And as for Miss Florand, she really does write such a good romance, doesn't she? Agree completely with you about the cover - I loved it and it immediately hooked me in. I very much wanted to know what was going on inside its covers. I really enjoyed reading your review and liked your point about the male protagonists owning their own emotions - didn't think about it earlier but reading what you said has made me think that that's one aspect of the writing that made the whole story so enjoyable for me as well! Hi Juhi! Thanks for stopping by. That's so funny you were reading the Queen's Thief books. I adore them. Which is your favorite so far? These covers are great and I wish they were continuing with them in the series. The fact that the men she writes aren't completely emotionally stunted just really worked for me. They are refreshing in their openness. I've just started the first one in the series after your review last week - I bumped it up my TBR list. The tension and the chocolate cravings are killing me! I'm happy to hear there is a sequel and that it has magical realism too - I can't wait! Ooh. Thanks for letting me know, Alexa! These books are indulgent and lovely with it. Like I said, I was a bit leery of how the second one would go, but I loved it so. I love all of these books! I love the settings, the characters & the sensuality in each of them. Thanks for the great review! So glad you loved. I loved. So, so much. I read your review before my copy arrived, and it definitely whet my appetite. I can't wait! I can't wait! For some reason, the French could not pronounce Maggie so I ended up having to go by Magali. Maybe it's because I watched Like Water for Chocolate when I was younger, but chocolate + magic realism ALWAYS works for me. :) Screw it, I think I'm just going to go ahead and order the paperback copy. Amazing covers must be supported!! Do it, Maggie! Press order. the book cover looks nice! and the book title sounds sweet!! I loved the first book in this series, and the next two after it, but this one didn't work for me as well. I felt as thought the magic thing was being pushed too hard. I do love reading her heroes though! A handsome French chef who shows his feelings ... yes please! Yeah, it seemed as though the magical elements threw some readers off. I thought that might be the case for me, but wow did I love Magalie and Philippe. Interestingly, THE CHOCOLATE ROSE didn't work for me as well.